All too often, plans for spending time outdoors are ruined by pesky mosquitoes who refuse to leave the party. The good news is, there are numerous things you can do to help keep these unwanted guests from crashing your well-planned event. Some people find it advantageous to employ a number of these methods at one time for best results. Numerous chemical-based products on the market are designed to keep mosquitoes at bay. If you have water on or near your property, you may want to consider using larvicides. These chemicals are designed to control mosquito larvae -- to nip the problem in the bud so to speak. 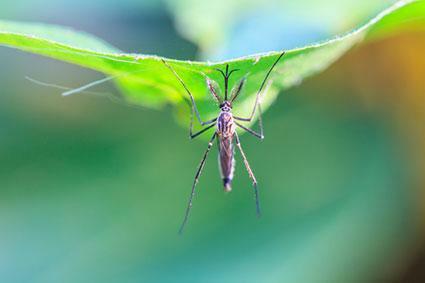 During the larval stage, mosquitoes are all concentrated in one area so it makes elimination a bit easier. Chemicals such as BTI (a bacterium that produces a lethal toxin), kill larvae quickly. Other chemicals stunt the growth of the mosquito at the larval stage. 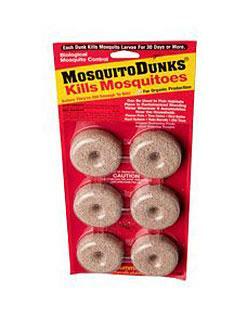 If you have water around you can also get something called mosquito dunks. You place these tablets in places with water such as animal troughs, birdbaths, and ponds, and they will kill larvae. Adulticides are used in fog and spray products designed to kill flying insects including mosquitoes. The downside of these products is that adult mosquitoes are on the move and can fly away from fog or spray. However, if you have a concentrated area that you wish to protect, a fogger can help keep mosquitoes away for a limited time in a limited area such as a screen porch, gazebo or small patio area. There is some controversy around the use of chemical pest controls and health. Although generally effective, chemicals alternatives may have side effects for humans and pets. This is especially true if they contain DEET (N,N-diethyl-m-toluamide). While this chemical is highly effective in killing mosquitoes and other flying insects, many people feel that its risks are not worth its use. It is always best to research any product before using it to be sure it is safe for your home, family and pets. 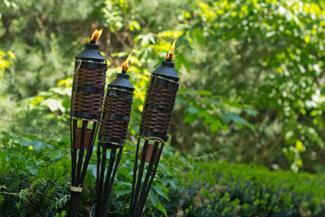 Citronella is one of the foremost ingredients in most mosquito repellents. 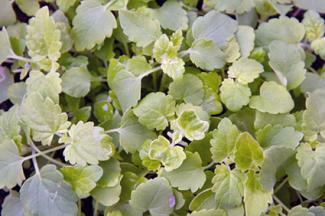 This lovely perennial plant has a strong aroma that masks other scents, which confuses mosquitoes. Grow citronella in pots or right in the ground around your outdoor living spaces for best results. Keep in mind that this clumping grass can reach 5 or 6 feet in height. Your cat will love you but the mosquitoes will hate you if you grow this known mosquito deterrent. Research has found catnip to be ten times more effective at controlling mosquitoes than DEET. A few plants scattered around your outdoor areas in pots will help tremendously to keep mosquitoes away. Not only is lavender a stunning purple flowering plant with a highly pleasing aroma, it is an effective natural mosquito repellent. For best results, plant lavender in full sun and well-drained soil and water plants when soil is dry to the touch. There are numerous types of lavender available, be sure to choose one that is most suitable for your growing region. Geraniums add a splash of color to any landscape and offer a fair amount of mosquito protection. Try planting a trailing variety in a hanging pot and place it strategically on decks or patios where you like to relax and entertain. There are a number of different devices that you can purchase to manage mosquitoes in your yard. Some people find that using devices along with plants work effectively as a deterrent. The benefits of using devices are that they don't actually leave a chemical residue or let off any dangerous toxins and they don't require gardening care like plants. Most devices are readily available at your local home improvement store or garden center. Electronic insect killers are usually hung from a tree or a pole; they can also stand alone if you purchase a large enough unit. Also known as bug zappers, they work by drawing insects to an ultraviolet light and shocking them. If power is an issue, you can also purchase portable bug zappers that work on propane. On the upside, zappers can cover a large area and are generally effective at killing mosquitoes. On the downside, zappers are not overly attractive and make a bit of noise. In addition, once the bugs are dead, some zappers let off a sort of dead bug mist where the dead bug parts are released into the air. This can be kind of gross if your zapper is located anywhere near your outdoor living space. As mentioned, citronella is an effective mosquito repellent. If you are having a gathering outside try placing some citronella candles out or even using tiki torches with citronella fuel. Both are good ways to keep flies and mosquitoes at bay but can sometimes be hard to use if it is a windy day/night. A nice thing about citronella candles or torches is that they add to the ambiance of your outdoor space while serving a purpose at the same time. Insect traps are similar to electronic zappers in that they lure the insect to the trap and catch it. This can be in the form of a bag (either alone or attached to a fan) or even a sticky strip that's been treated to attract and kill the bugs. The effectiveness of these traps depends on a number of things, including placement and weather. Insect traps are good to use in an enclosed area such as a screened in patio or gazebo. Some people feel they are also unsightly so don't use them. One of the best ways to keep your mosquito population in check is to employ preventative measures. Keeping your yard area well-mowed, disposing of standing water and keeping areas with garbage empty and clean. In addition, you can also make many organic repellants using common everyday ingredients. These non- toxic solutions include such things as garlic and essential oils and can be applied or sprayed directly on your skin or clothing. Some people say that you can even chew on a piece of garlic to keep bugs, including mosquitoes, away. Another way to reduce the population of mosquitoes on your property is to introduce predators -- animals that love to have mosquitoes for dinner including toads, swallows, bats, and dragonflies. Create habitats in your yard for these animals and you should see a notable difference in the number of mosquitoes. Mosquitoes can put a bend in any outdoor fun and it is important to assess the degree to which they are getting in your way and take appropriate action. Most likely, you will settle on a couple of different approaches to deal with these pesky and painful critters.